Next decide if you want to use an installer which will create shortcuts and is better for beginners or the extractable version with no install. 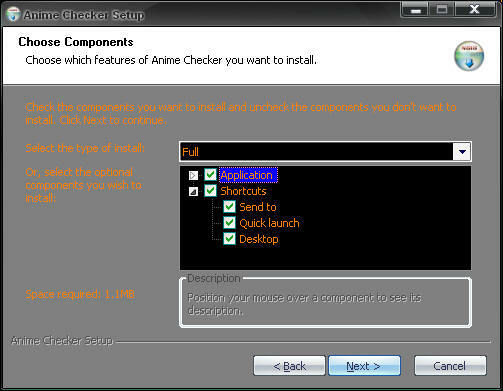 Download the installer using the Anime Checker 0.9.6.1 (windows setup) link on the website. Double click on the installer then click I Agree on the first page that pops up, then the following page will appear. Select the Full option which will give you shortcuts. Edit these settings if you wish, then click Next. A new page will appear asking for the Install location, either leave this alone or change if you wish. Hit Next. After it installs close the window and you have successfully install Anime Checker. Click the link for the Anime Checker 0.9.6.1 (windows) and save the file when it pops up with a download. Move the folder where you wish and create shortcuts also if you wish. You have completed extracting Anime Checker on you computer. The simple way to use Anime Checker is to open the program, the select some anime, and finally drag and drop the anime files into the Anime Checker program. The following picture is an example of how the programs looks. I dragged and dropped a few episodes I had onto the program. The first episode did not match the crc in the file name so there is a red exclamation point and File no OK listed for that episode. The rest of the episodes did match crc and have a green checkmark and File ok listed for those. To check more episodes simply drag and drop more episodes onto the window and the current list will clear and the new episodes will check. 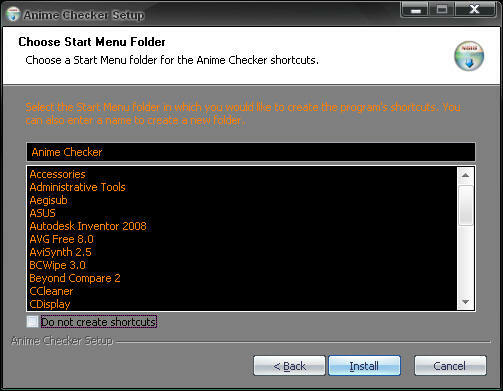 If you chose to install Anime Checker there is a handy shortcut you can use. First select the files you wish to check then right click and go to the Send to option. In that submenu there will be Anime Checker (if you chose the send to option while installing). Simply select that and the files will start checking in Anime Checker. Also whole folders can be dragged and dropped onto Anime Checker. Anime-Supreme is not affiliated with Anime Checker in anyway. We just feel it's a great way to check our anime.